Why Aren’t Boys Reading YA Fiction? Every author hopes their work will transcend all demographics. Yet, there are obvious tropes that go along with each genre. Sci-fi is for the 40-year-old man who lives with his parents, romance is for the 65 year old woman who yearns for youth, and young adult is for the pre-teen girl, hormones raging. At least, that’s what society tells us. Doesn’t it seem unfair that marketers portray such exclusionary tactics? I believe so. Let’s get to the root of one problem with a simple question: Why aren’t boys reading YA fiction? Problem #1: Marketing toward girls. Many, if not most, YA novels are marketed toward girls. Not only that, they also create a system where girls are supposed to be obsessed with dreamy characters. 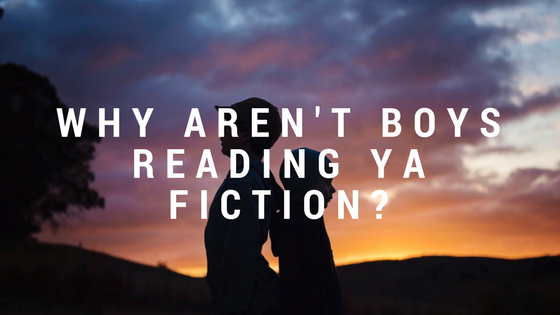 As stated in a previous blog, YA fiction is littered with romance — nearly every book has it. It’s fine to have a romance subplot, but the way marketers play up the romance makes an uncomfortable situation for boys who want to read a good story. However, when a boy is found reading a romantic book, he may be ostracized and bullied. Rather than face this negative behaviors, boys may opt out of reading for fun altogether. Problem #2: Lack of well-developed male characters. There are plenty of books featuring male protagonists. However, these characters may not be relatable to the average boy. This problem comes from the issue of character development. Too often, male characters are given one trait: brooding, shy, aggressive, and goofy are some of the more common ones. Rather than utilizing the wide range of emotions, personalities, and behaviors, authors tend to stick to one stereotype for each male character. This is damaging and reinforces the social pressure on boys to not express themselves. Problem #3: Unhealthy fan communities. The Internet is an amazing tool, but it is also home to some of the most ruthless people. Boys who are interested in YA may be shunned from online communities, or harassed by women who enjoy a male-free space. This lack of community can cause some boys to feel alone in their appreciation of reading. Coupled with possible harassment at school, boys might not feel like they have a place as a fan. Problem #4: Doesn’t address the tough issues. Boys have many of the same problems as girls. Mental illness, eating disorders/body image, and abuse are all shown to be prevalent in boys’ lives. Yet, many young adult books tackling these subjects focus on women as the abused or mentally ill. Although this is a negative concept for both men and women, boys who are dealing with these issues may have a tougher time finding characters to relate to. It is already a problem that domestically abused men are not often believed, and a lack of relatable characters further isolates these men. Young adult fiction is full of great characters, male and female. However, it is no doubt that girls are favored in this genre over boys. Although there are plenty of books that are not specifically gender identified, social norms and pressures may be enough to ward boys off from reading. If you’re a YA writer, consider finding ways to include realistic male characters in your works. You may be able to make a difference and encourage more boys to start reading.